View More In Cash Trays. Stackable system holds rolled coins. Capacity and denomination etched on front. Color-coded to banking standards. Handles on both ends. Unbreakable yet lightweight plastic. Trays interlock with large capacity coin trays MMF21207 Series, in same denomination. Coin wrappers sold separately. 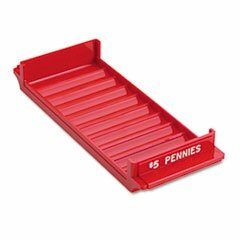 Cash Drawer/Box/Tray Type: Tray; Denomination: $5/Pennies; Money Tray Features: Interlockable; Stackable; Material(s): Plastic.